The Golden Shears has become the iconic event for the shearing and wool-handling industry in New Zealand. It was first held at the Masterton War Memorial Stadium on 9-11 March 1961, with nearly 300 shearers from New Zealand and Australia, including the legendary Godfrey Bowen, taking part. 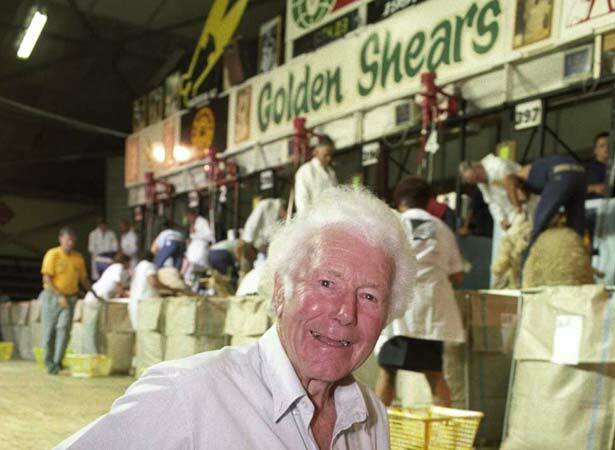 Godfrey’s brother Ivan Bowen became the first Golden Shears champion. In 1958 members of the Wairarapa Young Farmers’ Club had the idea of holdng a shearing competition at the annual Agricultural and Pastoral Show. Shearers came from all over the country to compete. The competition was such a success that the organisers decided to take it to another level. The Wairarapa branch of Federated Farmers was approached to help run the competition. A bigger venue, the Masterton War Memorial Stadium, was secured and the name Golden Shears was agreed upon. Through the 1960s and ’70s it became a hugely popular event, with fierce rivalry between some of the great shearers of the land. By the late 1970s shearing had gone professional. With more competitions, more prize money and sponsorship on offer, many shearers adopted the attitudes and training regimes of professional athletes. The competition has come a long way from its humble origins, but the Golden Shears remains the ultimate prize for shearers in this country. In 2015 the Golden Shears crowned its first overseas-born and-raised champion, Scotsman Gavin Mutch, a 2012 world shearing champion who now farmed near Whangamōmona in Taranaki. The 2015 contest was also notable for the last appearance of 16-time Golden Shears champion David Fagan, who also won 12 world titles and set 10 world records. We have 5 biographies, 6 articles, related to First Golden Shears competition.